View Raleigh real estate & homes for sale on the interactive Raleigh Real Estate Map. 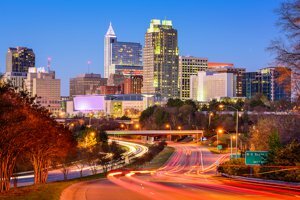 Welcome to the most comprehensive source for Raleigh real estate listings, Raleigh homes for sale, Raleigh real estate news, market stats, and research. Raleigh's affordable home prices and variety of properties offer a range of options for most home buyers'. Average real estate in Raleigh can range in price from $150,000 for a town home to $400,000 for a newer 4 bedroom home. The larger Triangle NC area offers luxurious gated communities, golf course properties, historic neighborhoods, horse communities, green home communities, and more! For the first time home buyer, Raleigh offers plenty of affordable homes for sale. Our powerful Raleigh Home Search allows home buyers and sellers to search and view all the relevant listing information on all Raleigh real estate listings for sale. The homes search tool allows you to search by county and city so you can view all Raleigh homes for sale. If you use the Advanced Search tool you can select from multiple criteria including Subdivision, Year Built, Acreage, Master on the First Floor, Design, Zip Code, Price, MLS Number, Property Address and more. Save your searches and receive daily or weekly email alerts of new property listings and price reductions. Click the "Add to Favorites" button to mark your favorite properties for later review. Click the Schedule a Showing link for a private tour of your favorite properties. One of our team members will contact you within the hour to schedule the showing. Or, click Contact Us for questions. TriangleRealEstateJournal.com also allows you to search through sold properties. In the past sold searches have only been available to REALTORS as members of the MLS. Now Triangle Real Estate Journal allows home buyers and sellers to view sold properties in their neighborhoods to help them learn more about Raleigh real estate. Sold Search. Lastly, we've added a Market Reports tool to allow home buyers and sellers to learn more about the real estate market in their neighborhood or town. To view Raleigh Real Estate Market Report. We've created a number of custom Raleigh real estate searches and links for you to easily discover the right the home, neighborhood, or area for you. We placed these searches in the sidebar to the right side of the site so you can easily access pre-made property searches and view homes right away. Examples include homes in N. Raleigh, Inside the Beltline home search, Historic Raleigh homes, Green Homes, Ranch Homes and more! To view popular Triangle NC real estate for sale refer to the side bar of this website. You will find common Triangle area communities, popular searches, popular neighborhoods, and more we selected for your convenience. TriangleRealEstateJournal.com features all MLS listings from 13 Triangle area counties including real estate in Raleigh, Chapel Hill, Durham, Wake Forest, Sanford, Fuquay-Varina, Cary, Apex, Chatham County, and several more! The Triangle derives it name from the area's three major citiies; Raleigh, Durham, and Chapel Hill forming a geographic Triangle. Within the Triangle you find a rich culture and lots of diversity making the area a wonderful place to call home. Raleigh NC is the 43 largest US city according to the 2010 US Census. More recently, Raleigh Rated Most Family Friendly City in the US. The stability of the Triangle's economy has enabled the greater Raleigh real estate market to remain relatively stable. NerdWallet ranked Raleigh-Cary as the best large metropolitan area in the country for home ownership. The area has a home ownership rate of 66.8% and median monthly home owner costs are $1,482. Email Ryan Ford - Triangle Real Estate Journal at ford@trianglerealestatejournal dot com to discuss relocation to the Triangle and Raleigh area or visit the Raleigh real estate blog for more articles and trends. Please enjoy the site and I hope you find it helpful in your Raleigh home search. Member of National Relocation. Amazon and Apple Coming to the Triangle? Click below to view the newest Raleigh homes for sale or create your own custom search of homes for sale in Raleigh.